This is the third tutorial of the Microsoft Mathematics Tutorial Series. The first tutorial is about the Introduction to the User Interface and the second tutorial is about Peforming Basic Numerical Computation. 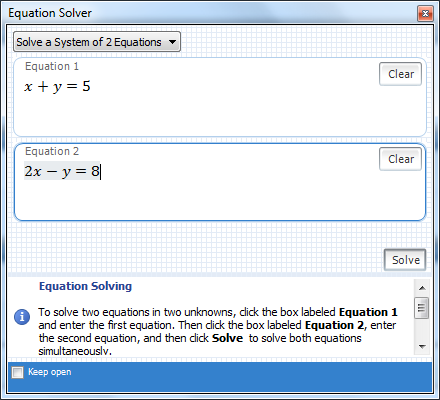 Aside from being a scientific calculator, Microsoft Mathematics is also a computer algebra system. It is capable of simplifying or expanding expressions, solving equations and inequalities, and performing other algebraic manipulations. In this post, we discuss some of the most used commands in solving equations and inequalities used in high school mathematics. 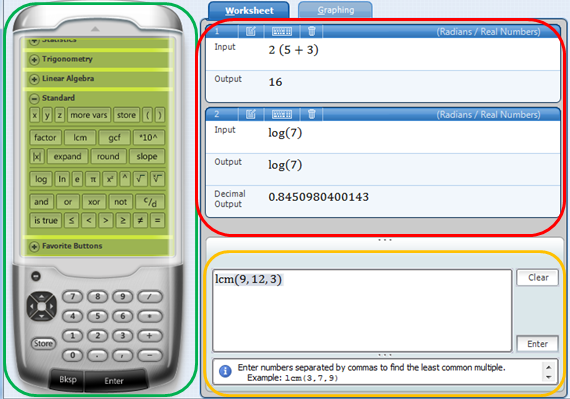 To try the examples below, open Microsoft Mathematics and be sure that you are on the Worksheet tab. To solve the equation , type 2x – 3 = 5 in the Input text box and then press the ENTER/RETURN key on your keyboard. The output of the command is shown below. This is the second tutorial in the Microsoft Mathematics Tutorial Series. In this tutorial, we learn how to perform basic mathematical computation using Microsoft Mathematics. There are three parts of Microsoft Mathematics used in numeric computations: the calculator pad (green box) where the command buttons are located, the input box (yellow box) where the commands are typed, and the output boxes where the input, the step by step computations (if applicable), and the output of the computations are displayed. 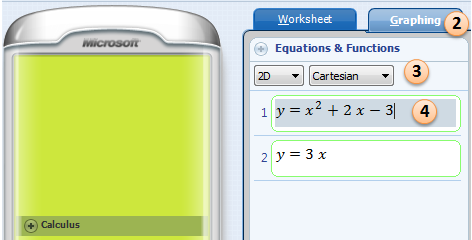 The input text box and the output boxes are located in the Worksheet tab.